WHY? To find your leader within, develop strategies to reach your personal goals, learn more about ourselves and how to work and serve our communities collaboratively. HOW? Each program day is designed to provide opportunities for personal growth, develop concepts and actions to become a catalyst toward positive change. This will be accomplished through the lens of a “voyage” as we embark on a journey to serve our communities. ​Kaua ʻi participants are from low and moderate income households. He wa'a he moku, he moku he wa'a, The canoe is an island, an island is a canoe. Voyaging canoes are among the most visible, widely supported symbols of Hawaiian culture. 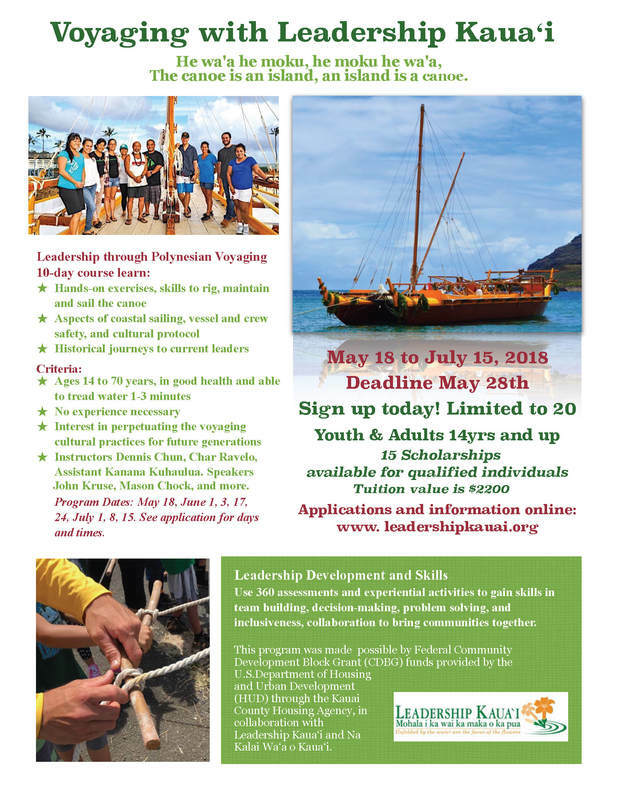 Leadership Kaua'i, in partnership Nā Kalai Waʻa ʻO Kauaʻi Namahoe, will work together to complete the Namahoe voyaging canoe and harness its authentic cultural lessons to train the next generation of leaders and practitioners on Kaua'i. Namahoe will also become an inspirational cultural centerpiece on Kaua'i - inviting islanders and visitors to experience the canoe, including tours or day sails, hear stories of the cultural significance of voyaging canoes, learn the wisdom of their navigation and life-sustaining cargo, and understand the need for both leadership and powerful teamwork to survive and succeed. 1. Complete the Namahoe voyaging canoe to represent Kauai, and provide islanders and visitors with authentic "hands-on" canoe activities. 2. Use cultural experts on Kauai to train new island practitioners with voyaging canoe skills and craftsmanship. 3. Create compelling and effective new leadership programs using Namahoe as a classroom and incorporate Hawaiian cultural lessons. Programs will be designed for all ages, youth to adult, and an advanced leadership challenge program will be created for CEOs in public and private sectors. 4. Reach out to the underserved and disenfranchised Native Hawaiian youth, to reconnect them to their roots, instill a sense of self-worth, identity, and fulfillment and successfully teach leadership and life skills for their future. Although the cultural power of the voyaging canoe is well-known, Kaua'i is without this important resource. The project will also raise the final funds for the canoe seaworthiness trials to meet the Hokulea in the Spring of 2018 and sail back to Hawaii with the sister canoes from each island. Namahoe will instill residents with a deeply felt sense of place and a renewed island pride as it sails alongside the canoes from other islands. LK programs have proven, measurable results in improving leadership and communication skills. The Namahoe-infused programs will build a strong network of people across generations and geography, ready to tackle the island's tough issues. More than 150 will directly participate in classes, seminars and workshops over three years. Perpetuate the ancient skills of voyaging canoes. At new sailors/watermen will be trained to pass the torch and perpetuate these skills. Native Hawaiian youth, and islanders of all cultures, will reconnect to the ancient wisdom and use it to forge a new future. Thousands of visitors will find deeper appreciation of the Native Hawaiian culture, and experience the real paradise on Kauai. We are all in our island canoe together. We believe that these authentic Namahoe experiences and world-class leadership programs will create new enthusiasm for the Hawaiian culture, teach us how to solve our island's critical issues, foster perseverance, and understand the clear need for us to paddle together into the future.